The first unified Korea was under the Silla, a Gyeongju-based empire that stretched over most of the peninsula. The empire fragmented in CE 870, giving way to the Koryo dynasty, who allied themselves with the Song dynasty in China. The Koryo emulated the Song in establishing an advanced cultural and technological society (including the invention of printing in 1234, two centuries before its discovery in the West). The peninsula fell to the Mongols in the 1230s. It took until the early 14th century, and the assistance of the Chinese Ming dynasty, to recover Korean independence. The Koryo dynasty was followed by the Choson in the 14th century, who governed Korea until the early 20th century. The early years of the Choson saw Korea enter a period of outstanding cultural and intellectual achievement; however, during this time, the country suffered invasions by the Japanese and then the Chinese Manchu dynasty. At the end of WWII, the Soviets and Americans agreed to divide Korea along latitude 38°N (the 38th parallel). As the Cold War evolved, a full-scale war broke out between the two sides in 1950. The three-year war engaged all the major powers and came closer than is often realised to provoking a nuclear conflagration. By 1953, a stalemate had been reached and an armistice was signed. For the next three decades, locked into opposing Cold War blocs, the two Koreas went their separate ways. South Korea developed a successful capitalist economy, but its political system was far from democratic: until the 1980s the country was run by a series of dictators who punished political dissent with imprisonment. However, the country's political leaders, with their powerbase in the monopolistic Democratic Justice Party, realised that some relaxation of the existing tight political control was necessary. So in 1981, martial law was lifted and within five years, a powerful parliamentary opposition had emerged in the form of the New Korea Democratic Party (NKDP), led by the veteran dissident Kim Dae-Jung. North-South relations hit a new nadir in 2010 with the sinking of a South Korean warship (and the deaths of 46 sailors on board), which put any hopes of reunification on hold. After a series of skirmishes in 2015, the two sides agreed a deal to defuse tensions. President Park Guen-hye, the first female president of South Korea, was elected in 2013 but impeached at the end of 2016 over a corruption scandal. Unlike her predecessors, she strove for a close relationship with the USA and spoke of wishing to unify the two Koreas. She was succeeded by Moon Jae-in in 2017. A former human rights lawyer and the son of North Korean refugees, the new president is known for his liberal views. 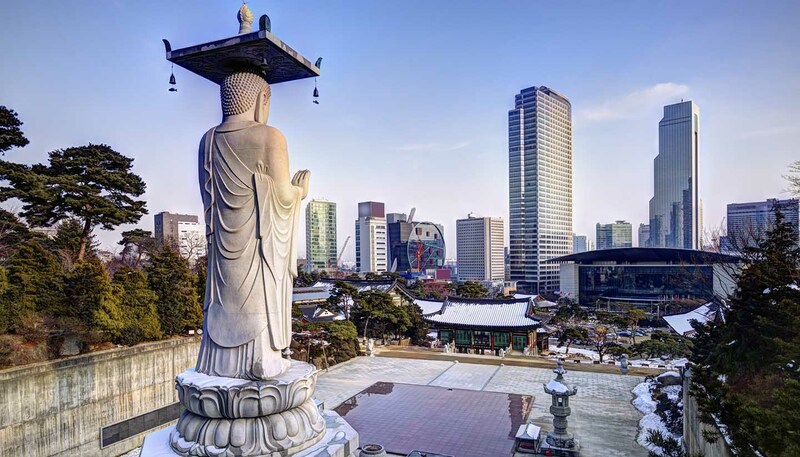 The region’s tumultuous history remains very much a part of present day South Korea and is something many Koreans feel strongly about – after a few sojus, the topic can get heated. •	Koreans count ages differently than we do in the West: when babies are born, they are considered to be one already. Every year at New Year’s (and not on their birthdays), they turn a year older. •	Until 2015, adultery was a criminal offence that could result in prison. •	The five most popular Korean surnames - Kim, Lee, Park, Choi and Chong – are used by more than half of the population. •	Though a ceasefire was signed in 1952, technically, the Korean War has never officially ended. This is one of the world's most homogeneous populations, but faith is divided largely between Christianity (27.6%) and the country's traditional faith of Buddhism (15.5%), with 56.9% of no formal religion. Confucian philosophy is generally followed out of generational habit, while Shamanism and the belief in ghosts and spirits are also strong. Cheondogyo is a Korean faith that has grown up out of Taoism, Confucianism and Christianity, and there is a small Islamic population. Shoes must be removed before entering a Korean home. Small gifts are customary; traditional etiquette requires using the right hand for giving and receiving. Seniority should always be respected - don't eat before the oldest person at the table has started. Koreans often ask your age and marital status to quickly gauge societal seniority. They can be very reserved, shy and resistant of body contact until they get to know you. Never leave chopsticks in your rice, and never beckon anyone with palm up using one finger, as this is the way Koreans call their dogs. Writing someone's name in red is bad as this symbolises death. The number four is considered unlucky and to give gifts in multiples of four is considered taboo; giving seven of an item is considered lucky. Traditional costume, or hanbok, is mainly worn on holidays and special occasions. For men it consists of a short jacket and loose trousers, called baji, that are tied at the ankles. Women's hanboks comprise a wrap-around skirt and a bolero-style jacket and is often called a chima-jeogori. Korean (Hangul), with English widely taught in school and generally understood in major centres.